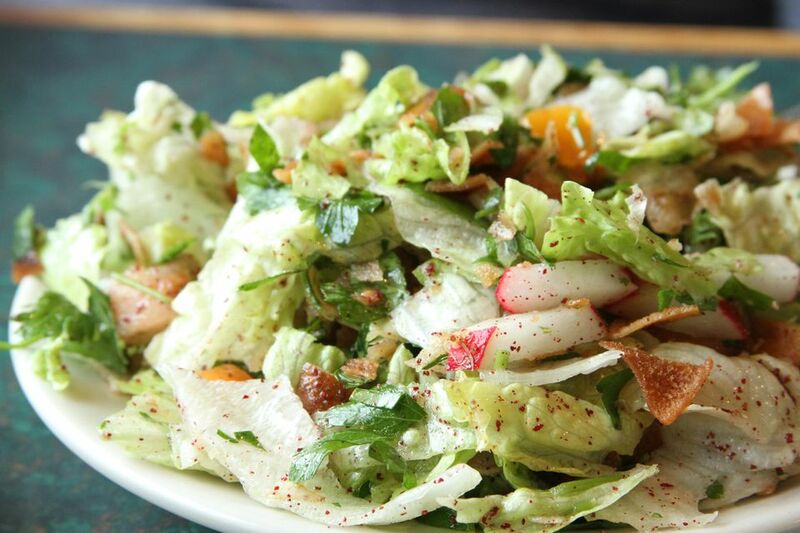 Fattoush is a popular salad in Middle Eastern cuisine and especially in Lebanon. In a sense, it's the Middle East's version of Italian panzanella which is a bread salad made with toasted croutons. Toasted bread cubes also feature prominently in Caesar salad, where the bread is often seasoned with grated Parmesan cheese. In panzanella, though, just as with fattoush, the bread is folded into the salad and is meant to absorb the dressing. Can I just say...yum! Panzanella is frequently made with hunks of sourdough and fattoush typically uses pita bread. But there's no hard and fast rule about it. You can tear up whatever toasted bread you like and include it in fattoush because it's more a method than a rule. The important element is that the bread be mixed in to absorb the dressing as opposed to being just a garnish on top. Although toasting the bread is more typical, it's also possible to fry it, just as Mexican cuisine uses fried tortilla bowls or strips in salads. You may also add whatever vegetables are in season that you have around such as asparagus. But the typical base of all Middle Eastern salads is lettuce, cucumber and tomatoes with frequent appearances by radishes and onions. Typical Middle Eastern dressings also rely on some tried and true ingredients. Namely, a basic vinaigrette made with olive oil, garlic and lemon juice rather than vinegar. Sumac, with it's lemon taste, is a common dressing ingredient as well. Enjoy! Toast the pita bread in a pre-heated 400 F oven for about 5 minutes. Then tear into 1-inch pieces. In a large bowl, combine the lettuce, toasted pita, cucumber, tomatoes, green peppers, onions, and parsley together. In a small bowl combine the garlic, olive oil, lemon juice, mint, salt, and pepper. Whisk together well. You can add many spices to this according to your tastes. Some good options would be sumac, which gives a lemony flavor, or cumin which has the quintessential taste of Middle Eastern cooking. Another option is to add chickpeas for a heartier salad.